Sparkling Flakes is a simply elegant style of snowflakes falling in a gold and silver pattern. This collection contains: Shopping Bags, Merchandise Bags and a coordinated Giftwrap perfect for laminating to Boxes, Apparel and Gable boxes! 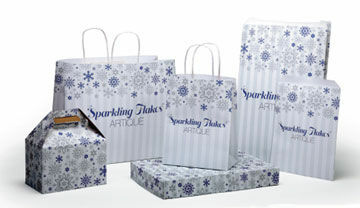 Pictured to the top right and directly below are examples after you customize with your own design colors and add your logo (Replace the Words Sparkling Flakes with your logo). NO ADDITIONAL charges for PREP & PLATES. •Giftwrap minimum 25 rolls 24” x 833’ Reams, Roll Stock may be used in combination with Boxes for smaller minimums. •Boxes requires 500#s Paper minimum varies on size(s) purchased and or combined with Roll stock.